This Mad Los Angeles Pianist Life-Amazing! Yesterday-I got up and handled domestics on the home front and drove off to Costa Mesa to play 12-5p at the Season’s 52. 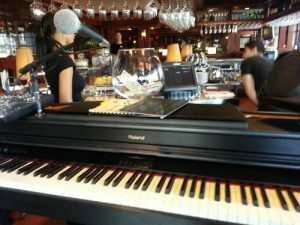 I’ve played many times for Season’s 52 Restaurants at the Century City and Santa Monica locations. Very nice company. Great Piano/Mic set up. Cool, great food. They like a contemporary upbeat vibe and I’ve learned all kinds of up to date music for playing there! I was not really ready to find the place just wall to wall with patrons at noon! The crowd- was great. One thing about the Costa Mesa Location is that it seems like you’re closer to the people sitting at the bar than at Century City. And the booths seem closer to the piano, and it has a more intimate feel to it. Anyway- Casey and Jewel were the bartenders and were oh so great to work with. Anyway, I’m looking forward to the next time playing there—soon! Freak out! turns out that the traffic on the 405 was so “LA traffic”that I took til about 7:48p to get there….And when I got there I just loaded all my “rig” onto the cart and headed for the front door. Thank goodness the people there were just awesome and so appreciative!! We just had a blast with Christmas Carols and then…. a bunch of Sinatra tunes, standards and such… right up to the end of quite a wonderful evening despite the way it had looked earlier! These sorts of things I often want to write about…because it is awesome to be a pianist and singer and to be able to do this for a living and to create the music. I don’t often feel like I have the time I’m often to slammed with all of the “work” it is to do all the other little details like driving to the gig.Exercising so I’m really “up” for the gig! Learning the songs for the wedding tomorrow or upgrading my equipment, marketing etc..! Fact is–I love what I do. I love it when people tell me how much they love that tune I just sang. Or how they haven’t heard “Melissa” for a long time but love the Allman Brothers and then tell me what it means to them or where they were when they first heard it. Or about seeing them in concert in 1979! I love the delight in singing Christmas Carols in a room of people that are just singing because it’s fun to do! Music is spiritual. It’s art! It’s beautiful!